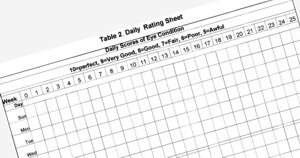 The Eye-Condition Rating Kit was developed by John L. Walmsley as an attempt to objectively monitor response to treatment and provide feedback to doctors. The Canadian Foundation exists to extend comfort, information and assistance to those afflicted by Benign Essential Blepharospasm, Cranial Dystonia (Meige Syndrome) and Hemifacial Spasm. It is hoped that the information provided on this page may be considered as a means to monitor the symptoms of those afflicted (patients), and thus provide information to the treating physician. The dialogue between patient and physician should ameliorate somewhat the patient's condition. BEBCRF hopes that the Eye Rating Kit is but the beginning for patients. As more information or tools of this type become available they will be made available to all on this page. You can download the Eye Condition Rating Kit as a PDF file here. For guidance on using the kit and background on its development, see the notes from our Spring 2011 Support Group Meeting in Calgary, and our Fall 2004 Support Group Meeting in Toronto.